The town of Damulog is situated in the hinterland boundaries of North Cotabato and Bukidnon. It is the only municipality in Bukidnon where five barangays were abandoned by their residents to seek refuge in evacuation centers at the height of the government offensives against suspected rebels and criminal groups last year. The villagers returned to their communities five months later, following the truce declared by the military forces and the Moro Islamic Liberation Front in July 2003. The people in Manaulanan and Lagunde in the town of Pikit in North Cotabato sensed trouble when the military came into their village on March 20. The soldiers said that they were sent to hunt down a group of armed men who earlier ambushed three members of a paramilitary group, killing one of them. The army troopers opened fire but the suspects were able to escape. When the gunfire subsided, a woman was reported to be killed in the crossfire. A cow and a carabao were also included in the casualty list. Some 3,000 villagers fled due to fear. They sought temporary shelters in the neighboring sitios of Bualan, Tapundok, Pamalian, and Idsap. Government social workers and NGOs provided them with relief rations. Though many of them have decided to return to their communities when the soldiers left, as of this writing others chose to stay in the evacuation centers for fear of renewed armed clashes. This incident is only one of the latest case of military operations that have forced thousands of people in mass exodus in North Cotabato and in other places in Mindanao (See Fr. Bert's article). Many would tend to view this kind of tragedy as a "natural occurrence" in southern Philippines, where an active Moro rebellion and a communist-led insurgency persist, alongside sprinkles of other armed groups. To them, this is a reminder that life is indeed difficult and, in a fatalistic sense, accept it as a part of the travails of existence in this parts of the archipelago. As a consequence of this view, the civilians caught in the line of fire are easily regarded as "collateral damage" --- a military jargon that found its way into the vocabulary of the Philippine armed forces and some government leaders. The term was widely used by American soldiers in Vietnam to depersonalize and desensitize them from the suffering and loss of thousands of lives of civilians because of their war of aggression. In the Philippines, where the prevailing idea of a disaster are those brought about by typhoons, earthquakes and floods, the phenomenon of internal displacement, as a consequence of armed conflict, has already reached a proportion that could no longer be ignored. More than 1 million people have already been affected by armed clashes since the government responded with an all-out military assault against Moro revolutionary fronts and criminal groups two years ago. This is nearly as many as those displaced by natural calamities placed by the Global IDP Project to be at 1.5 million people in 2001. Though the total war policy was lifted by President Gloria Macapagal Arroyo when she became chief executive in 2001, bombing operations and military actions against Moro rebels and the Abu Sayyaf terror group are taking their heavy toll on civilian populations. This has placed the Philippines on the list of top 40 countries all over the world where internal displacement is considered as a great disaster. In Southeast Asia, the Philippines ranks third after Burma and Indonesia as countries with most number of internally displaced persons. When disasters such as internal displacement strike, the physical effects are obvious and are the ones usually noticed --- loss of lives, destruction of home, properties, livestock, workplaces, places of worship. Too often, the emotional effects of disasters are taken as a normal reaction to a tragedy – which they truly are — but are taken for granted as a passing response to an extraordinary situation. It is seldom considered, especially by state authorities, government social workers and private service providers, that even more than the physical effects of disasters, the traumatic effects cause long lasting suffering, disability that impair the normal and meaningful functioning of individuals, families and communities. But what really happens to a person when he or she goes through a traumatic event such as war and internal displacement? What do the evacuees feel and experience under such circumstances? The story of one caseload being served by Balay in Parang, Maguindanao illustrates the experience common to traumatized evacuees who survived the armed conflict in Mindanao. "It was night time when the military attacked. My family was roused from our sleep by the sound of planes and gunfire. Without warning, the bombs fell. Mortar shells rained near our house. We hear shouting everywhere. People were running, wailing. Children were crying. My heart pounded very hard. My mouth was dry. I was stunned, I could barely speak. My body was tensed. My senses were on high alert. Anxiety washed over my body. Terror gripped my mind. I could hardly move. I could not understand what was going on. All I know was that our lives are in peril. "My parents told me to pick up my younger sister and grab a few clothes. We were moving out to get as far as possible from the sight and sound of war. We walked and ran under the cover of darkness. I could imagine our house being hit by bombs. After two days, we arrived in the town center where many other evacuees had sought refuge in a schoolhouse. We were tired and had not eaten, but I was too shocked and afraid to feel hungry. I could not believe that tragedy could happen to us." Shock, a sense of unreality, and fear dominate long after the fighting is over. At the evacuation centers the sight, sounds, smell, and feeling of the tragic event persist, leaving an indelibly horrendous image in the hearts and minds of the displaced persons. They grieve for the death of their loved ones and wonder how did they ever survived. Not a few dwell on feelings of guilt for not being able to save their parents, siblings or kin. Others feel devastated by the loss of their homes; for the destruction of treasured personal belongings such as school uniforms, family pictures, pets; for lost documents, and for lost of friends and familiar neighborhood. The extraordinary prevalence of such strong physiological, cognitive, and emotional responses to forcible displacement indicate that these are normal reactions to an extreme situation. The trauma being suffered by internally displaced persons is not a sign of "mental illness" or "moral weakness." They do not signify that traumatized people are going "crazy" or weak. However, unless their psychosocial disturbance is resolved relatively quickly, their distress may interfere with their ability to reconstruct their lives and shatter family and community relations. It may even lead to dysfunction and other debilitating emotional and behavioral conditions that will have devastating effects on the individual, their family, and their community. Staying for long period of time in the evacuation centers has forced the displaced persons to confront their ordeal in an unrelenting way. In addition to the mental and emotional distress, they have to bear with the loss of privacy in overcrowded temporary shelters. Poor sanitation, inadequate shelters, contaminated water may result to outbreak of diseases, leading to deaths. Having to rely on government agencies and private service providers for relief rations and other needs to live another day, the evacuees also have to confront their loss of independence. In many cases, this situation aggravates the deterioration in self-esteem especially among those who were economically-productive prior to their displacement. When usual family activities and economic preoccupation are disrupted, the authority of traditional breadwinners is also undercut, thus altering family dynamics. Women who lost their husbands at the height of the conflict are driven to take on roles usually culturally relegated to the menfolk. Older children may also assume functions in the family inappropriate for their age. Subsequently, parent-child conflict and marital distress could arise. An Iranun mother receiving psychosocial services from Balay in Parang, Maguindanao has been complaining that her 8-year old son gives her headache since they returned to their village after the military left. Her boy, she observed, had been shouting back at her. It also became difficult for her to ask her son to do his usual household chore. The woman said that life had been doubly stressful for her since her husband died at the height of the armed conflict in their village. Aside from trying to earn enough to feed her children, she has to face up to the responsibility of raising her brood by herself. Feeling tired most of the time and uncertain over their future, she became unusually impatient and irritable, which shows on her attitude towards her children. During a parent-child encounter, she realized that her stress has been getting into her boy's nerves. This drives him to shout back at her. She also learned that her son feels irritated of the stream of orders from her, especially when he is studying. According to the boy, he is trying hard to catch up with the studies that he missed when they evacuated. He said that most of his friends are ahead of him now which gives him a sense of pity and shame for himself. When given the chance to resume his education through Balay's educational assistance, he considered it as an opportunity to erase that stigma. His passion for his studies and the need of her overburdened mother for somebody to lighten up their family load has led to family stress which they eventually resolved through family dialogue, counseling, self-awareness activities, scheduling of chores and household responsibilities, and livelihood assistance from their partner-NGO. The destruction of communities and the socio-cultural fabric of internally displaced persons also cuts a deep wound in their hearts and minds. They reel from the loss tied to their cultural activities and social identities. To them, their mass exodus has separated them from their familiar world, or from a homeland where they draw their sense of safety and traditional subsistence, and where they find meaning in their lives as individuals and as a people. To many evacuees, the ensuing feelings of loss and grief drive them to doubt themselves and their capabilities to go on with their lives. They also develop, if not heighten, feelings of mistrust towards others, especially to authorities and peoples they view as responsible for their misery. 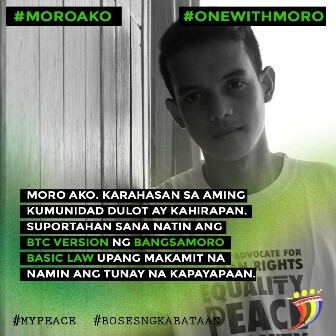 In one community being served by Balay in North Cotabato, a schism developed in the harmonious co-habitation of Moro and the non-Moro population following a violent incident. As cohesion in the village was lost due to their displacement, the traditional divisions in the community along ethnic and religious lines resurfaced. Memories of social oppression and feelings of marginalization was exacerbated. Before their displacement, the Moros who are Muslims and the non-Moro Christian settlers who came from other parts of the country have been living together in that village as one community since the 1930s. They shared food, helped each other in tending their farms, respected each other's rituals, and allowed their children to play together. And being good neighbors as they are, whatever little misunderstanding come their way was resolved in a non-antagonistic manner. Throughout the years, their community bonding grew stronger to the point that interfaith and inter-cultural marriages became possible and acceptable to them. But when armed conflict erupted in their midst, the Moros and the settlers separated and moved to different evacuation sites. Feelings of animosity emerged as they blamed one another in an effort to make sense of the tragedy that happened in their community. Old neighbors refuse to see each other in the eyes. Friendship between Muslim and Christian children was broken. Balay counselors provided the occasion for the community to restore their respect and trust for each other. Through a summer camp, Moro and Christian children were given the chance to play with each other once more. Those who showed signs of deep-seated anger and hostility during the activities were diagnosed as needing sustained psychosocial intervention. They were subsequently processed with the help of their families. Through structured learning exercises and games, the children recalled the good memories of their community prior to their displacement. Their sharing of stories enabled them to make a sense of the tragic event in their village, and realized the ties that bond them together as peace builders. Balay provided psychosocial care to other families and individuals who were experiencing prolonged bereavement and behavioral disorders. Family and group therapies were introduced. Trauma as a result of the violent incident was explained to community members. Orientation on psychosocial intervention was also given to them, while a number of volunteers completed a para-counselor training. Human rights education and peer-counselors training were also extended to both adults and youth alike. A year after Balay started its psychosocial work in the community, Muslims and Christian neighbors are visiting each other again. They also invite each other to join in the observance of each other's rituals. The children formed a Christian-Muslim youth organization. The adults organized a cooperative participated in by both Moros and non-Moros alike. As of this writing, preparations are underway for them to have a training on disaster preparedness and management where they could form coordinating committees to respond in an organized and collective manner in case another tragedy befall on their community again. Though the villagers still feel anxious about the possibility of the recurrence of the armed conflict, they have somehow managed to face their life one day at a time and get on with the usual flow of life and co-existence. The impact of armed conflict and internal displacement to individuals, families and communities are interrelated and inseparable. The trauma affecting the emotional and behavioral responses of an individual would, in one way or the other, take its toll on the relationship between, or among, parents and siblings. Social disruptions both reduces and interferes with the healing effects of the family and the community and is in itself an enormous source of stress on the individuals who make up the family and the community. For many victims, these symptoms fade with time. But for many others, there may be longer–term emotional effects, both obvious and subtle, especially if no psychological intervention is introduced. As the days and weeks pass by in an evacuation center, a displaced person may begin to experience a wide variety of emotional disturbances such as chronic grief, depression, anxiety and guilt. Others may show signs of irritability and hostility. Some may demonstrate difficulties in controlling anger and suspiciousness. It is also not uncommon for traumatized evacuees to keep to themselves and shun other people. Sleep disturbances due to nightmares and flashing images of the tragedy will haunt many of them. During waking hours, the sights and sound of their ordeal may return to them as if the disaster is happening all over again, reinforcing their sense of helplessness and hopelessness. There may be cultural variations in the precise patterns in which disaster-related symptoms appear, but findings of an ongoing Balay study on the psychosocial impact of internal displacement in seven armed conflict-affected communities in Mindanao indicate that the emotional responses to disasters are broadly similar. However, the degree of risk of adverse mental and emotional consequences tend to be influenced by a number of factors. The more severe the disaster and the more terrifying the experiences of an individual, family or community, the greater the likelihood of intense and lasting psychological effects. Balay caseloads who have lost a family member or have come close to death themselves have shown to be suffering from intense grief and abnormal bereavement than those who escaped from harm. Children who barely survived in the violent conflicts and those who lost their treasured personal belongings such as books, pets and school uniforms have exhibited aggression and hostility. They have also taken more time to restore their social relations with other children. The mental and physical consequences of a disaster which are intentionally inflicted by others, such as a military assault, are likely to be greater than those disasters which may have been produced by natural disasters, such as typhoons or floods. Many displaced persons who came from villages destroyed by military operations are blaming soldiers and leaders from the national government for their miserable lives. Those who returned to their place of origin and discovered that their homes and place of worship have been ransacked, vandalized or desecrated harbored feelings of hatred, if not vengeance. These responses may not be as strong, if manifested at all, among survivors of natural calamities such as floods, earthquakes and tsunamis like the one that hit Gen. Santos City and Saranggani in February. In addition to the effects of internal displacement, the negative experiences of evacuees in temporary shelters, "tent cities," and other evacuation centers (malnutrition, epidemics, physical assaults, and other human rights violations) produce adverse emotional and behavioral effects and psychological disorders. An old Kalagan woman whose two sons were abducted by suspected military forces in Mati, Davao Oriental in the aftermath of their displacement suffered from shock. For months, she would not speak, spending her time staring blankly as tears swelled from her eyes. She could hardly eat either. Her eldest daughter had to force food into her mouth. Her sons remain missing up to this time, but she was able to get past her shock and depression with the help of her family and Balay counselors. &Mac183; Being forcibly separated from a place that provides a source of security and subsistence prolongs the trauma and self-healing. But contrary to the common notion, the disaster does not end to many displaced person even if they have returned to their place of origin. They remain in highly stressful, even repeated traumatic situation, especially if the armed men whom they considered as their stressors still occupy their villages. The lack of rehabilitation assistance to rebuild their lives and mend mental anguish reinforces their negative feelings over their ordeal. The availability of social support network --- sympathetic clan members or relatives, friends, community, religious leaders and institutions, and partner service providers --- reduce the likelihood of lasting emotional and mental trauma. In a number of "tent cities," the evacuees who are mostly blood relatives share whatever meager rations they have. Others moved in with their relatives and friends in town centers that are relatively far from the sites of battle. Some political and religious leaders offered their land as temporary settlement sites for the displaced, such as in Aflek in T'boli, South Cotabato and in Simuay, Sultan Kudarat in Maguindanao. The ustadzes, imams and datus contribute to the strengthening of the moral and spiritual resilience of their displaced constituencies. Wherever accessible, the madrasas or Arabic schools provide the continuity of the intellectual, religious and social education of children and youth. In Sirawai, Zamboanga del Norte, the literacy and numeracy program initiated by Balay served to enhance the coping resources of the displaced Kolibugans and contributed to rebuilding family and community solidarity. Those who have survived and coped up with a similar kind of disaster in the past, such as those who have repeatedly experienced or exposed to armed conflict and internal displacement may show more resilience in confronting their ordeal. A number of Moro evacuees in an evacuation center in Maguindanao indicate that they have been "immune" to such tragedies, suggesting that they have come to accept it as a consequence of the military response to their aspiration to have an independent homeland. Since armed-conflict induced disaster and internal displacement affect different individuals, families and communities in different degrees, and because many of the psychological effects of displacement are created or affected by the direct social and economic circumstances, responses to this kind of disaster ought not to be purely physical, psychological nor economical relief, but psychosocial. In the following article, the writer recounts the real-life ordeal of the victims of war in Mindanao, some of whom are presently receiving psychosocial care and rehabilitation from Balay. As head of the Disaster Response Team in Pikit, North Cotabato, Fr. Bert is a charismatic advocate of "Space for Peace" and inter-religious dialogue. He presented this "personal sharing" during the Panday Kalinaw (Peace Conference) held during the Human Rights Day Celebration in Miriam College on December 10, 2001. Mindanao to many is the land of the wild. To me, it is my home. Mindanao is dear to me. It is my homeland. With the land area of approximately 10.2 million hectares, it is three times larger than Belgium, twice larger than Switzerland, and Fifteen times bigger than Singapore. It is the home of three diverse people-the Lumads, the Moro, and the Christian settlers. The family is a critical support system to human beings before, during and after stressful events. It is but normal those members of the family system and are also affected, sometimes even more than the victim him/herself. The whole system "changes" with the victim's traumatization. The routine in the house, the family structure, communication patterns, including schedules are affected because of the inclusive effect of a traumatic event in the family.